Last Wednesday I looked outsite to see what I thought was a small, black bunny eating the stale Wheat Thins I threw out for the birds. After a closer look I realized it was a kitten, not a bunny, probably no more than six months old. His eyes were big and yellow, standing out from his dark fur. I quickly put some cat food out there so he would have something to proper to eat. It has been cold outside and I was worried about him staying out there. Over the next couple of days, we played a game of chase. We'd see the kitten eating but by the time the door was open he'd be hiding under the deck. By Saturday we were about to get into single digit cold weather. We bought a live trap at the local hardware store as a last resort to catch him. We baited the trap and then set a timer so we could keep an eye on it. Within 45 minutes the little black kitten was trapped. He didn't want to go at first and tried so hard to escape as I carried him inside. We set him up in a shower stall with a bed, food, water, and a litter pan. At first, he gave me a couple hisses and refused to leave the bed until he was alone. Within 24 hours he was running around the room, begging to be loved. Head butting and licking my hand each time I went in to check on him. I assumed he was feral, but it was obvious that he was from a home. His coat was clean and he had no fear of humans. This was not the little scared cat that came in the day before. Earlier this afternoon he had a visit to the vet. We wanted to make sure he didn’t have FIV or any contagious disease our other cats could catch. He got a clean bill of health except the vet thinks he has worms so he’ll be getting some medicine for the next month. He is about 3 and a half pounds and probably four to six months old. We also found out he is really a “she”. Too bad I’ve already named him Chumley. We’ll have to see if that name sticks. We have placed a couple signs in the neighborhood and will try to track down his home. If no one claims him, I think it’s safe to say he’ll have a good home here with us. It’s only been less than three months since we lost Patrick and I wasn’t ready to bring in a new cat, but when something like this happens what else can you do? This little cat needs us. How can we say "no" to those big, yellow eyes??? Nothing. You can't. Sounds like he adopted you. You've got a new buddy. My cat, Mystery, found me the same way. Wishing you many more years of head butts from Chumley. Nice story. What a sweet little kitty! I absolutely love black cats. Did you end up keeping him?? Glad you have a new pet cat! He's very cute and charming by the way. May you have a fun time nurturing him. I hope little Chumlea (female version of Chumley, same pronunciation ;) has found a happy home with you! remonds me of when we found our Chesney, we first named "her" Chelsea. I was also adopted by a little black cat. 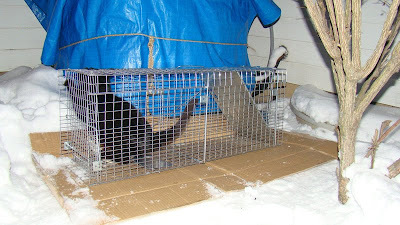 The day of the first big snow fall of the year ( I live in Canada) I came across a dangerously skinny little black kitten. I took one look at her and said" You can't stay outside, are you coming with me?" She followed me all the way home and came straight in the house. That was 5 years ago and Loulou has made me laugh every day since. Thank you for all of the kind comments. It's over four years later and the little black kitten is still living here. 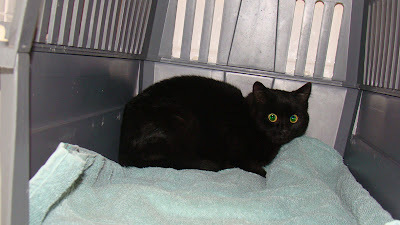 The little black kitten now goes by the name Boo Bambalam and she's not so little any more. Boo can be a bully to Gato at times but I sure do love this cat!